China-Made ARJ21-700 Arrives in Chengdu for Flight Test__Commercial Aircraft Corporation of China, Ltd.
China-made ARJ21-700 advanced regional jet Monday made its debut in Chengdu, touching down at Chengdu Shuangliu International Airport (CTU). 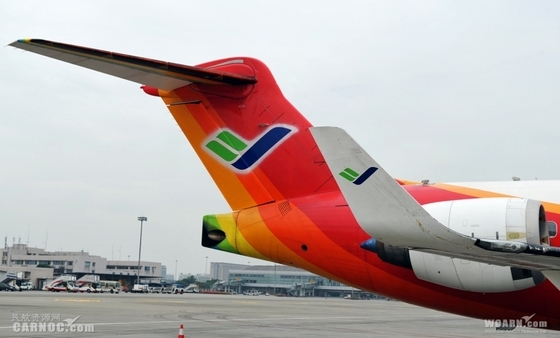 The ARJ21-700 aircraft will conduct a 10-day flight test in Chengdu. Before its arrival in Chengdu, the aircraft has completed flight test in Sanya. Launch customer Chengdu Airlines (EU) said it is preparing for the delivery of its first ARJ21-700. The ARJ21 is a short and medium range regional jet made by China in accordance with international standards. The ARJ21 aircraft has a standard flight range of 2,220 km, and its extended version has a flight range of up to 3,704 km. Commercial Aircraft Corporation of China, Ltd. (COMAC) said the ARJ21 aircraft has received 258 orders from customers at home and abroad. Actually, the aircraft has started flight tests since its maiden flight in 2008. It is learnt that the aircraft has been undergoing flight tests under the standards of the U.S. Federal Aviation Administration (FAA). Earning a FAA type certification is a precondition for the ARJ21-700 to enter the world market. The first ARJ21 is scheduled to be handed over to launch customer Chengdu Airlines by the end of 2014.